To enhance the functionality of Key Logger, Data Doctor provides an extensive solution to Key logger with its advanced functionality that enables user to record keystrokes, clipboard content, application activities, voice chat conversation and captures the Windows screenshots at regular interval of time in a hidden encrypted file. Computer Keylogger utility records internet activities including visited website, temp files, cookies, online chat conversations with option to export all the details in excel file format. 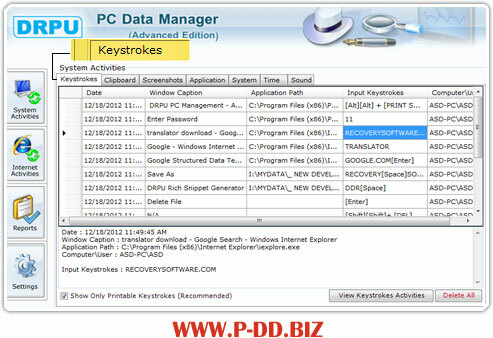 Invisible Key Logger is very easy to use and remain in hidden attributed from Desktop, Startup menu, Task manager, Add/Remove programs and even hides software installation files and folders. Advance Key logger helpful for office (to records the activities of employees in office working time in your absence), home (to keep track of children PC activities) and other similar users. Secretly records typed keystrokes, voice chat conversation, clipboard activities, application activities, sound activities, system startup time and capture Windows screenshots at regular interval of time period. Monitor internet activities including visited website, voice chat conversations, temp files, and cookies with option to export recorded details in excel file formats. Record the data in hidden password protected and encrypted file. Sends recorded log of activities automatically to user specified email address or upload log file via FTP server. External users can’t detect the Key Logger installations on the computer. Safe and secure surveillance utility runs in Standard or Hidden mode. Software is invisible from Desktop, Startup menu, Task manager, Add/Remove program list and software installation files. User can record and view date and time of every session created. Provides facility to set hot key and run command to access software if runs in hidden mode. Facilitate to view backup of recorded data for future reference. Provides attractive and interactive graphical user interface and does not require any prior technical skills to operate it.